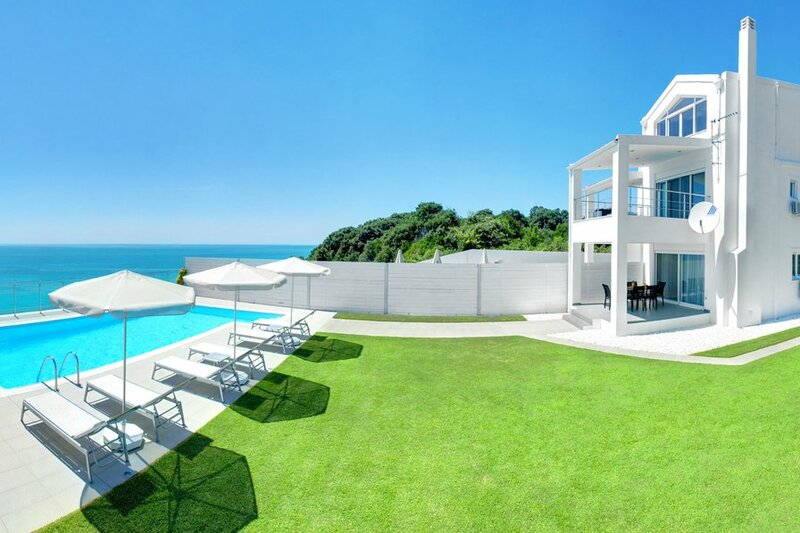 Luxury Seafront Villa with Private heated Pool, Gym, and Playground for children. Amazing Sea View, with direct access to the beach. Peaceful location ideal for families seeking relaxation. Newly built contemporary villa, with a minimalist design, build with of the best materials and equipped for all your needs to enjoy this luxurious accommodation. This is an amazing 4 bedroom villa, with a private heated pool, Gym, playground for children, and very nice pool area which gives you all the space you need for you and your family or friends to relax and enjoy, with steps directly down to a quiet peaceful beach. The villa has a total area of 280m² and consists of three floors: basement, ground floor and first floor which are connected by an internal staircase. The basement consists of a bedroom with en suite bathroom, laundry room, two storage rooms and a Gym. The ground floor is open plan and includes a fully fitted kitchen complete with all appliances, a dining area, a sitting area with fireplace, guest-toilette, and two bedrooms with en-suite bathrooms. From the main level you can enjoy direct access to the pool for relaxing and sunbathing. On the first floor, there is the bedroom with en suite bathroom, and a terrace with amazing sea view. Private parking area, swimming pool with sun lounges and umbrellas, safe deposit box, air-condition, wireless internet access, satellite TV provided.It is only 40 minutes drive from Corfu Airport, with supermarket shopping a 10 minute drive, and a great taverna only 1 minutes walk away. Bedroom 1 (ground floor) with ensuite: Double bed (COCO-MAT Sleep system), A/C unit, Satellite TV, Balcony with a spectacular sea view, Shower, WC, Single washbasin. Bedroom 2 (ground floor) with ensuite: Double bed (COCO-MAT Sleep system), A/C unit, Satellite TV, Balcony with a spectacular sea view, Shower, WC, Single washbasin. Bedroom 3 (firtst floor) with ensuite: Double bed (COCO-MAT Sleep system) A/C unit, Satellite TV, Balcony with a spectacular sea view, Shower, WC, Single washbasin, with free standing bath. Bedroom 4 (basement) with ensuite: Double bed (COCO-MAT Sleep system) A/C unit, Satellite TV Shower, WC, Single washbasin. KITCHEN: The fully-equipped kitchen comprises of everything that you may require: Electric oven, range hood, dishwasher, fridge, microwave oven, sandwich maker, toaster, electric kettle, coffee machine, espresso machine, filtered coffee machine. UTILITY ROOM: Comprises of the essentials: Iron and ironing table, washing machine, pantry. LIVING AREA: High quality design and furnishing, comprising of a comfortable four-seater sofa, LCD satellite television, DVD, CD player, wireless internet. DINING AREA: A table and seats which accommodate 8 people, overlooking the sea. LINEN CHANGE / HOUSEKEEPING: Weekly. The pool is cleaned and attended to very early in the morning every other day. A huge plot of 1800m² with grass. Private heated pool 50m² for each villa. The pool is 1.00m shallow end, and 1.70m deep end, no diving is permitted. Sun loungers (8), parasols (3). Private secure parking for 2 cars. Private Hot tub for six person. The villas are perfect for all ages, are fully air-conditioned, have wireless internet connection, a first aid kit, and safe box. All bedroom and bathroom windows are fitted with insect screens. Three hairdryer has been provided. If you are travelling with young children, please let us know and we can provide cot/highchair, if required. The pool at this villa are fitted with a Pool Heat Pump and with a isothermal cover with manual roller, to ensure that the temperature of the water is perfect for swim even if the weather isn’t being particularly kind. Pool heaters can bring the pool temperature between 27℃ to 30℃ making it more than warm enough for everybody to fully enjoy their villa. Due to the hot weather in the peak summer months, the pool heating will be switched off. Hopefully the water will already be warm enough!!! Towels and sheets are provided during your stay. We can arrange and car hire on your behalf, please email for details. The owners reside at as short distance from the villas, and personally attend to the rental of the villas as well as the customer service ensuring that their guests’ stay is as comfortable and pleasant as possible. Our beach front of property is fabulous for swimming, with clear water, also 5 min walk is the Halikounas beach (4km sandy beach) one of the largest and most beautiful beaches of Corfu - ideal for those early morning walks or jogging.